They’re HERE! The East Coast of the US is in the middle of a noisy invasion…. by completely harmless insects. Cicadas spend most of their life underground sucking on the the roots of trees, until it is time to emerge as flying adults. There are over 1,000 species of cicadas around the world, with varying life cycles. Periodical cicadas are known for their 17- or 13-year synchronized life cycles and loud singing choruses. These cicadas have black bodies, red eyes, and the wonderful Genus name Magicicada. They are indeed magical, and being in the middle of a periodical brood emergence is a special experience! What’s a brood? Periodical cicadas exist in different regions, and have cycles of emergence that are not in sync. There are 12 groups of Magicicadas with 17 year life cycles, and 3 groups of Magicicadas with 13 year life cycles. Oh, and to make that more confusing? There are 7 species of Magicicada. Brood II is emerging this year–you can see the full US Brood II Map here. There is a wonderful video about the periodicial cicada life cycle that is up at Kickstarter; enjoy! Don’t live on the east coast, or in one of the emergence areas? You still might have dog-day cicadas! While the 17-year cicadas get a lot of press, there are also yearly cicadas. In the US, these are all in the Genus Tibicen (Latin for “flute player”). The species I hear most is Tibicen canicularus. These cicadas have life cycles of about 3 years, but broods overlap so adults emerge each year. They don’t emerge in large numbers like the periodical cicadas, and they are more cryptically colored (and bigger!). Possibly the only time cicadas have been used in a felony? List of US cicada species, and their songs! Cicada Man! A very strange sci-fi film from Japan. Is there any published explanation for the pair of populations in North Georgia being separated from the main body of broods? I don’t know that they are separated any more than the other broods. Can you explain a bit more about what you mean? There are two populations at the Western end of North Carolina/north of Georgia that are separated from the rest of the groups by 300 or 400 miles. 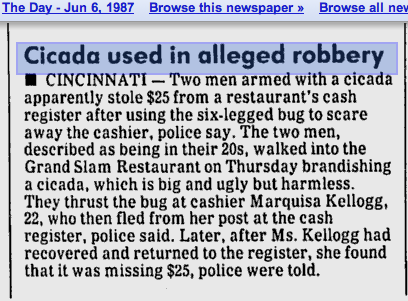 My last cicada encounter was in Ohio in 1987. It was so incredible. As I recall, that was a larger than typical brood, though it might just be my memory embiggening it. In any case, I haven’t experienced the wonder of cicadas since I moved to Oregon in 1990. Alas. They also seem to like the sound of bagpipes. We attended the Illinois Highland Games a few years ago when there was a brood that emerged. The judges had to give a bug handicap to the pipers who were competing since the cicadas would start crawling over them while they were standing still and playing. The mental image of bagpipers covered in cicadas is awesome and horrible at the same time. I love the fact that Brood II is nicknamed “The East Coast Brood,” and that Brood X (which last appeared in 2004) is the even better “Great Eastern Brood,” because they both also accurately describe my teenage years. I also remember once, when I was Nature Director at a Cub Scout camp, we found a pre-molting cicada hanging on the trunk of a tree near the nature lodge. Throughout the day, I would bring the kids over to it and watch it as it progressively pulled its huge new body out of its tiny little shell. It was AWESOME. So, which year was it back in the nineties when the 13 year and the 17 year cicadas had their only chance to crossbreed (if they were able and willing to do so–that was the whole mystery) in over 200 years? The periodic cicadas look like an interesting example of reproductive isolation. I wonder if there’s been any study of gene flow between broods. Cicadas are big and ugly and scare cashiers? What’s ugly about a cicada? I can’t imagine it scaring someone who was not entomophobic.